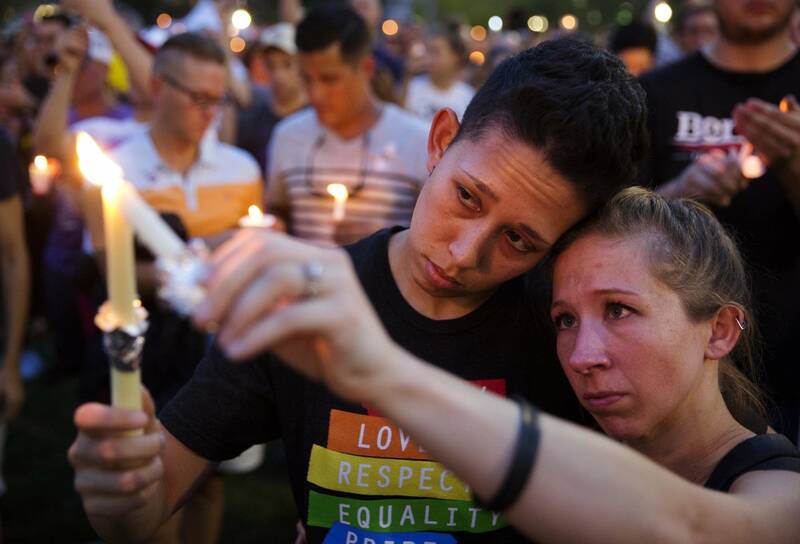 As thousands in Orlando turned out to mourn 49 people killed inside a gay nightclub, federal investigators examined possible motives for the gunman who committed the worst mass shooting in modern U.S. history. The White House and the FBI said 29-year-old Omar Mateen, an American born Muslim, appears to be a "homegrown extremist" who had touted support not just for the Islamic State, but other radical groups that are its enemies. "So far, we see no indication that this was a plot directed from outside the United States, and we see no indication that he was part of any kind of network," FBI Director James Comey said Monday. He said Mateen was clearly "radicalized," at least in part via the internet. Despite Mateen's pledge of support to the Islamic State, other possible explanations emerged. His ex-wife said he suffered from mental illness. There were questions emerging if he was conflicted about his own sexuality. And his Afghan-immigrant father suggested he may have acted out of anti-gay hatred. He said his son got angry recently about seeing two men kiss. Meanwhile, thousands gathered Monday night in downtown Orlando for a vigil to support the victims and survivors of the Pulse nightclub shooting. The names of the dead were read aloud. It was held on the lawn of Orlando's main performing arts venue, where mourners created a makeshift memorial of flowers, candles and notes for the victims. Many in the crowd said they felt compelled to attend the vigil because of the important role Pulse played in their lives. "It was a place that a young 20-year-old who wasn't openly gay felt safe for the first time," said Cathleen Daus, now 36, who had worked at Pulse in her twenties. "Pulse gave me confidence, made me realize I was normal and so much like everyone else." Some, like Jason Primar, who lost two friends in the massacre, released balloons that flew high above the downtown skyscrapers. Primar went to the club at 2 a.m. Sunday, hoping to have a good time with friends. Instead, he was greeted with gunshots and the anxiety of worrying about his two friends inside. "I felt like I was over in Iraq," he said. He called his two friends inside and they never answered. He later discovered they died. Comey said the FBI was also trying to determine whether Mateen had recently scouted Disney World as a potential target, as reported by People.com, which cited an unidentified federal law enforcement source. "We're still working through that," Comey said. The FBI chief defended the bureau's handling of Mateen during two previous investigations into his apparent terrorist sympathies. As for whether there was anything the FBI should have done differently, "so far, the honest answer is, I don't think so," Comey said. The Orlando Sentinel and other news organizations quoted regular customers at the gay bar as saying they had seen Mateen there a number of times. "Sometimes he would go over in the corner and sit and drink by himself, and other times he would get so drunk he was loud and belligerent," said Ty Smith. Smith said he saw the killer inside at least a dozen times. Jim Van Horn, 71, said he was a frequent patron at Pulse and said another "regular" there was Mateen. "He was trying to pick up people. Men," Van Horn told The Associated Press late Monday outside the Parliament House, another gay club. Van Horn said he met Mateen once. He said the younger man was telling him about his ex-wife. "My friends came out from the back and said, 'Let's go take pictures on the patio,' " Van Horn said. "So I left. And then they told me they didn't want me talking to him, because they thought he was a strange person." Wielding an AR-15 semi-automatic rifle and a handgun, Mateen opened fire at Pulse Orlando early Sunday in a three-hour shooting rampage and hostage siege that ended with a SWAT team killing him. During the attack, he called 911 to profess allegiance to the Islamic State group. At the White House, President Barack Obama said there is no clear evidence so far that Mateen was directed by the group, calling the attack an apparent example of "homegrown extremism." Obama is traveling to Orlando Thursday to pay respect to the victims and stand in solidarity with the community, the White House said Monday evening. More details of the bloodbath emerged, with Orlando Police Chief John Mina saying Mateen was "cool and calm" during phone calls with police negotiators. But the chief said he decided to send the SWAT team in and bash through a wall after Mateen holed up with hostages in a bathroom and began to talk about bombs and an explosive vest. "We knew there would be an imminent loss of life," Mina said. As it turned out, Mateen had no explosives with him. In Orlando, mourners piled bouquets around a makeshift memorial, and people broke down in tears and held their hands to their faces while passing through the growing collection of flowers, candles and signs about a mile from the site of the massacre. "We will not be defined by the act of a cowardly hater," vowed Mayor Buddy Dyer, whose city of a quarter-million people is known around the globe as the home of Walt Disney World and other theme parks. The tragedy hit the city's gay and Hispanic communities especially hard. It was Latino Night at the club when the attack occurred. "As the names come out, they are overwhelmingly Latino and Hispanic names," said Christina Hernandez, a Hispanic activist. "These were not just victims of the LBGT community, but of the Hispanic community, as well. This was senseless bloodshed." Five of the wounded were reported in grave condition, meaning the death toll could rise and a call has gone out for blood donations. Mateen's grasp of the differences between Islamic extremist groups appeared shaky. During three calls with 911 dispatchers, Mateen not only professed allegiance to the Islamic State but also expressed solidarity with a suicide bomber from the Syrian rebel group Nusra Front, and a few years ago he claimed connections to Hezbollah, too — both ISIS enemies, according to Comey. The FBI became aware of Mateen in 2013 when co-workers reported that the private security guard claimed to have family connections to al-Qaida and to be a member of Hezbollah, too, Comey said. He was also quoted as saying he hoped law enforcement would raid his apartment and assault his wife and child so that he could martyr himself. The FBI launched a 10-month preliminary investigation, following Mateen, reviewing his communications and questioning him, the FBI chief said. Mateen claimed he made the remarks in anger because co-workers were teasing him and discriminating against him as a Muslim, and the FBI eventually closed the case, Comey said. His name surfaced again as part of another investigation into the Nusra Front bomber. The FBI found Mateen and the man had attended the same mosque and knew each other casually, but the investigation turned up "no ties of any consequence," Comey said. Mateen was added to a terror watch list in 2013 when he was investigated, but was taken off it soon after the matter was closed, according to Comey. People who are in that database are not automatically barred from buying guns, and in any case Mateen purchased his weapons in June, long after he was removed from the list. The Islamic State's radio hailed the attack and called Mateen "one of the soldiers of the caliphate in America." But it gave no indication the group planned or knew of the attack beforehand. Counterterrorism experts have been warning in the past few years about the danger of so-called lone wolf attackers who act in sympathy with extremist groups like the Islamic State but are not directed by them. Mateen's father, Seddique Mir Mateen, told reporters that the massacre was "the act of a terrorist," and added: "I apologize for what my son did. I am as sad and mad as you guys are." He wouldn't go into details about any religious or political views his son held, saying he didn't know. Asked whether he missed his son, he said: "I don't miss anything about him. What he did was against humanity."